Different types of carpeting and area rugs are used in commercial and residential settings to enhance the look and comfort of the space. However, when the carpeting becomes stained or dirty, it has the exact opposite effect. Homes that have dirty carpeting can make it seem like your home is poorly maintained, which can give off the wrong impression to your visitors. This is worse for businesses as customers, clients, and visitors may be put off by your company if the carpeting in your office is worn out or stained. You can maintain your carpeting and area rugs with regular vacuuming, but this alone will not restore stained or soiled carpeting. Rainbow International provides complete carpet cleaning services in Harlingen, TX to deep clean and restore carpeting for homes and businesses. We use only the best methodologies and equipment available to ensure that we leave your carpeting free of debris and stains. These services will not only restore your carpeting and area rugs to their original condition, but also help them last longer. At Rainbow International, our certified technicians are equipped to deep clean and restore any type of carpeting or area rug. We use advanced cleaning methods that effectively remove dirt and debris that has accumulated in the carpet fibers, and our powerful cleaning products can also remove odors and stains. Carpeting in both homes and commercial buildings experiences foot traffic that causes a constant buildup of debris in the fibers. This buildup of debris can cause the carpet to become discolored and eventually lead to deterioration, shortening the life of the carpet. You can reduce the debris buildup with regular vacuuming, but it takes professional cleaning to fully remove the debris. 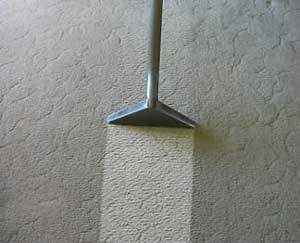 The carpeting and area rugs are vacuumed using agitation and a high-quality filter to remove loose debris. A preconditioning solution is applied to separate the debris from the carpet fibers. Agitation helps the preconditioning solution work deeper into the fibers. The carpeting and area rugs are cleaned using truck-mounted equipment that applies and extracts a hot water cleaning solution. The carpet fibers are groomed to help the appearance of the pile and prevent matting. The carpet is dried to avoid odors that develop from damp carpeting. Your carpet and area rugs collect dirt and debris each day and this buildup can eventually affect the look and life of your carpeting. If you want the carpeting in your home or business restored to its original appearance, contact Rainbow International for professional carpet cleaning. We will effectively restore your carpeting to its original condition and it will be dry and ready for use within one day. You can call us any time at (956) 622-7349 to schedule a carpet cleaning appointment in Harlingen, TX.